Rescuers are on board a Thai navy board during a search operation in the water off Phuket, Thailand, Friday, July 6, 2018. Thai divers scoured the wreckage of a boat with Chinese tourists that sank in a storm off the resort island of Phuket. The death toll from Thursday's tragedy climbed to 41, in Thailand's biggest tourist-related disaster in years. It was not clear how many of the dead and missing were Chinese. In announcing a previous death toll of 33, authorities said all of those victims were Chinese. "It's very difficult to see ... it's traumatic, it's tragic but the best thing to do, our job as divers, is to bring back the bodies to their families," diver Philip Entremont told reporters before resuming the search Saturday. Prime Minister Prayuth Chan-ocha, the leader of Thailand's military government, expressed his "sympathies and deepest condolences" to the families of the dead. The government will "exert all efforts to find those still missing and provide support to all survivors of this tragic event," he said in a statement. Chinese Ambassador Lyu Jian had an "emergency conversation" by phone with Thai Deputy Prime Minister Somkid Jatusripitak, the Chinese Embassy said in a statement. 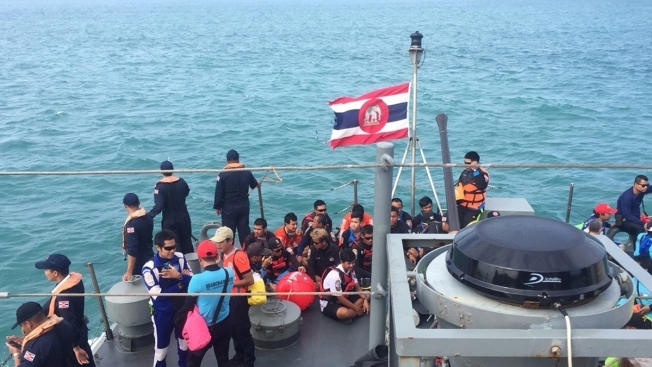 It quoted the envoy calling on Thailand to quickly mobilize an intensive search for the missing and "to tend and make appropriate arrangements for the rescued Chinese tourists, treat and cure the injured and receive family members of the Chinese tourists involved." At the request of Phuket's governor, the Phuket Tourist Association was seeking 80 volunteer Chinese language translators to assist the outgoing Chinese passengers at the provincial airport. It said that 37 of the furniture company's employees and family members had traveled together to Phuket and that on July 5 at around 5 p.m. they encountered the "biggest storm in five years" and they sought the government's help. The group had booked their tours to the islands online on their own, said the posting. The accidents came as rescuers, also led by Thai navy divers, support 12 boys and their soccer coach stranded nearly two weeks inside a flooded cave in the country's far north, and try to determine how and when to extract them.